TL; DR: Small businesses often need to scale up for projects. The work needs to get done, but a company can’t always justify the cost of onboarding full-time employees. Fiverr is a global marketplace that simplifies the on-demand gig economy, connecting businesses with talented freelancers who can accomplish projects quickly and efficiently. Popular job categories include graphic design, video, audio, and copywriting, and hundreds of thousands of freelancers compete in price and quality to attract the attention of millions of entrepreneurs across the globe. Businesses always know what to expect with the transparency that comes with viewable portfolios and clear pricing packages, which reduces friction going into projects. Imagine for a moment you’re the owner of a small-town music venue. You have this fantastic idea for a new summer concert series that should really bring in big crowds. The wheels are in motion, and you’ve already convinced a handful of the most popular bands in the area to play gigs on a series of Saturdays in June and July. Any concert promoter worth his or her salt knows getting the word out is essential in luring flocks of music fans. You have a decent website and your Facebook, Twitter, and Instagram feeds are driving solid attendance to many of your shows. But you want this series to be special, so you decide to go all in with press releases, flyers, posters, TV and radio commercials, and a social media onslaught. You have these grand plans, but your staffing is limited and most of your resources will be devoted to paying all of the best bands to play the shows. You need to find a way to get all of these promotional projects done at a fair rate. 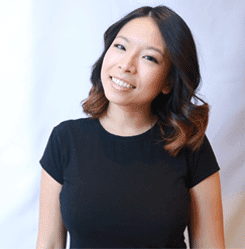 Business Development & Market Strategist for Fiverr Aimy Ngo explained how her company’s platform connects buyers and sellers to get work done at fair prices. So if you’re running this music venue, you can use Fiverr to accomplish a laundry list of small tasks that help you accomplish your goals, taking your concert series to the next level of professionalism. You’ll need a graphic designer for a distinctive logo and eye-catching posters and flyers. You’ll need a copywriter for your press releases and video and radio scripts. Plus, you’ll need a video editor and someone to do voiceover work. According to ZenPayroll, companies can save as much as 30% in payroll costs using freelancers compared with paying full-time staff for the same job. Fiverr connects you to a network of talented people, many of whom will tackle all of your jobs, leaving you to focus on the bigger picture. 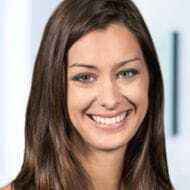 Micha Kaufman started Fiverr in 2009 as a platform for buyers and sellers to connect to get jobs done for $5 — hence the name Fiverr. Based on the evolution of the marketplace, Fiverr decided it would be mutually beneficial to think about the needs of its community and not limit the platform to $5 when much more work could be available by being flexible on price. The evolution happened in stages. First, sellers who had proven themselves based on completed gigs and buyer feedback were given the option of offering extras to the basic $5 package of a gig. For example, a graphic designer could offer a black-and-white logo with limited revisions for the standard rate, while offering the option of a color logo with unlimited revisions for $10. This has evolved into the availability of basic, standard, and premium packages for each gig. “In the past few years, we’ve really become more focused on saying, ‘OK, how do we help entrepreneurs and small businesses who want to get things done grow and scale their business?” Aimy said. The answer to this question came in November of 2015 when Fiverr decided to remove all limits to base rates on gigs. The addition of pricing packages created transparency so buyers on Fiverr know what to expect from a seller. Built-in transparency and a lack of friction have been important parts of the equation for Fiverr. Sellers receive star ratings based on buyer feedback and the number of gigs they’ve successfully completed, and buyers know exactly what they’re getting at each package level on each gig. Think for a moment about how this system used to work. If you needed a job done, you would go to the classified ads or Craigslist to find people offering skills. Then you’d have to go through a time-consuming process of vetting these people to find out if they were any good, set up invoices, and deal with purchase orders. 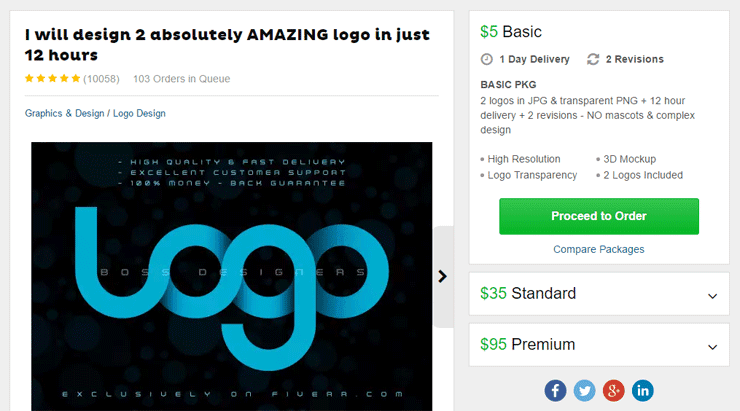 Fiverr operates under a simple pricing structure. Buyers pay a processing fee of $1 on purchases up to $20 and 5% on purchases over $20, and sellers keep 80% of each gig they successfully complete. Fiverr’s security measures keep personal information private, providing a buffer between buyers and sellers and ensuring everyone is satisfied following transactions. Hundreds of thousands of sellers spanning 190 countries make up a vast Fiverr talent pool that serves a community of buyers in the millions. While people across the globe are active on Fiverr, a high percentage of sellers are native English speakers, which is great because most of Fiverr’s buyers are concentrated in the United States and the United Kingdom. One in three U.S. residents now work as freelancers with nearly 54 million Americans participating in some version of independent work in 2015, according to Spera, a provider of tools and resources for freelancers and entrepreneurs. And that number continues to grow. That same report estimated that half of the U.K.’s workforce will be self-employed in the next five years. Music and audio is one of the many categories on Fiverr, and it includes sellers of voiceover work and custom guitar solos. Buyers benefit because sellers compete with each other on price and quality, and this applies to more than a hundred different types of projects. Some of the more popular categories on Fiverr include graphic design, video and animation, music and audio, writing and translation, and digital marketing services. “Fiverr helps companies find and hire talented people across the world who can easily handle these freelance jobs at reasonable rates, connecting businesses to talented people who can get things done,” Aimy said. With a platform hosting a global marketplace, it’s fitting that Fiverr itself is a global company. Headquartered in Tel Aviv, Israel, Fiverr also has a U.S. footprint with offices in New York, San Francisco, Miami, and Chicago. Fiverr can help a music venue owner, or any small business owner, quickly source help for the many tasks that go into larger projects, like promoting a concert series. Thanks to competitive prices, all of the tasks for hyping a concert series can now be accomplished. You can hire every freelancer you need while trusting that you’ll get high-quality results with pre-vetted talent. By using Fiverr, you can keep operating costs low with efficient full-time staffing and scale up with freelance help whenever the need arises. The crowdsourcing of global talent maximizes efficiency and helps entrepreneurs get work done. “Through our platform, entrepreneurs can connect to freelancers who offer a host of services that will allow them to find solutions for their businesses,” Aimy said.